I've been a headache sufferer for years. Some weeks I find myself forgetting what it's like to not have a headache. I get all kinds — sinus, tension, hormonal, I-ate-dinner-too-late — basically every damn kind of headache you can think of. Ibuprofen helps most of the time, but taking too much of that isn't great, either. So a few months ago, I was feeling kind of stuck. But like a superhero bursting into a scene with a heartening crescendo, enter: Migrastil Migraine Stick. I actually discovered this product in a BuzzFeed roundup of headache and migraine products that Amazon reviewers loved. Over the summer, my doctor had recommended I take less ibuprofen to prevent "rebound headaches" (oh yay, another kind! ), which, as the name suggests, can happen as a rebound effect after taking medicine for a headache. I was really trying, but it was impossible to get through the day without doing something for my pounding head. So when I saw how many of my fellow sufferers swore by this product, I had to give it a try: $11 and a bottle small enough for me to to carry with me everywhere? It was a no-brainer (no pun intended). 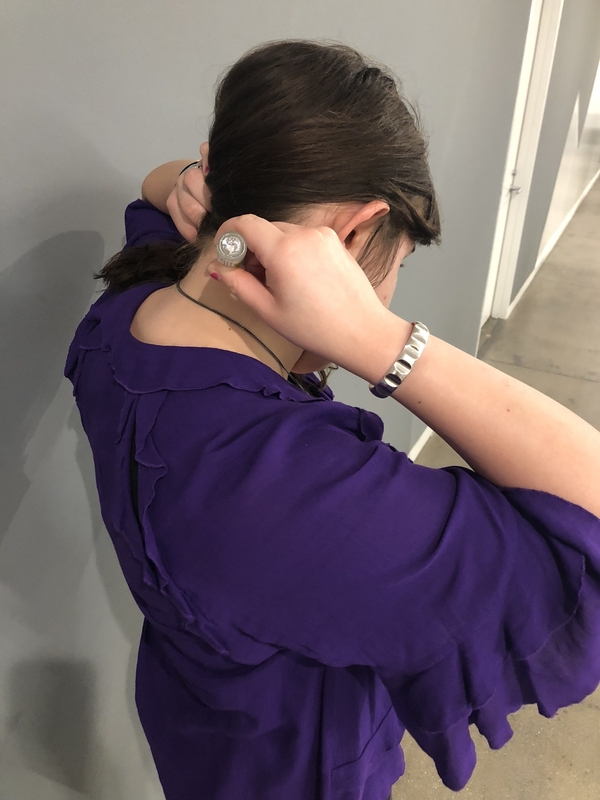 Now, I'm not someone who's into essential oils, and strong scents often trigger my headaches instead of helping them, so I was a bit skeptical of the oil stick at first. Turns out, though, the fragrance level is just right. It includes three scents that I actually like — peppermint, spearmint, and lavender — and the smell is more refreshing and sinus-clearing than perfumey. It's a completely clear oil that doesn't leave your forehead all shiny. 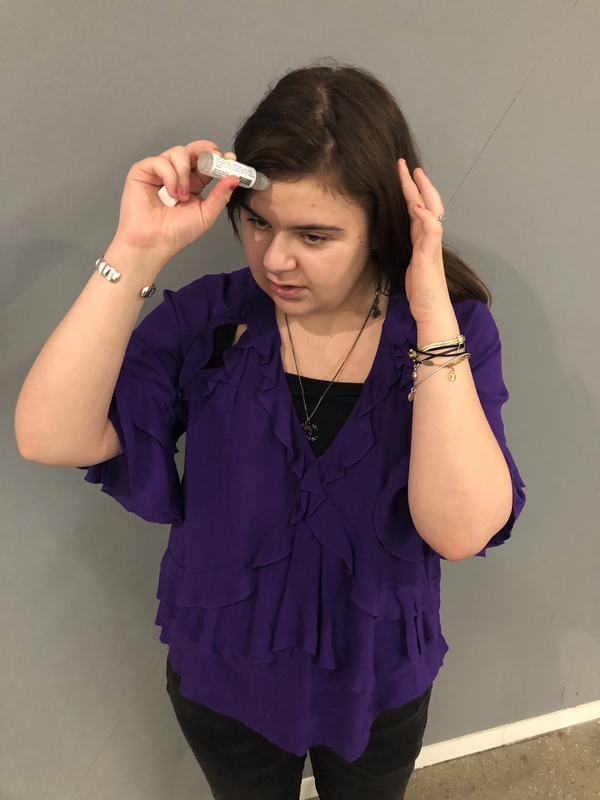 You use the simple roll-on applicator to apply a bit to your forehead and temples (don't go too crazy or you may accidentally get some in your eyes), and then apply as much as you want to the back of your neck. Within 30 seconds, you'll start to feel cooling relief. The stick provides a pleasant, cool, tingling feeling, almost like VapoRub. It lessens the intensity of the pain, and, if my headache is dull or just starting, it can make it go away almost entirely. If nothing else, it at least extends how long I can go without taking ibuprofen and delays the splitting headache I sometimes feel coming after a long day. I've taken so much less Advil since I started using this! Plus, you can reapply as often as you need. For those of you worried about putting oil on your face, I get it. I have bangs, so I tend to break out on my forehead, but my hair usually covers it. I haven't noticed a huge difference in my acne since I started using this, and honestly, a pimple here or there is totally worth it for the relief. You're supposed to put most of it on the back of your neck, anyway. Besides how well and how fast it works, my favorite thing about this product is its size — which is roughly the same as a tube of lipstick, so it's always in my purse. I can't go anywhere without it, and it's so comforting to know that I have it in case a headache strikes. My mom has suffered from migraines for as long as I can remember, so I put some of this in her Christmas stocking. She loved it; while it couldn't make her migraines totally disappear, it provided much-needed relief so she could enjoy her day. Do I still sometimes have really stubborn headaches? Have I made the mistake of putting too much of this on my temples and made my eyes water a bit? Yes and yes. But I still consider the Migrastil Migraine Stick a small miracle and something that has definitely changed my life for the better. "Is this science? Witchcraft? Who cares! I have no earthly idea why this works, but it brought me back from the dead after an 11-day headache. I found it worked better if I covered my hotpack in this, zapped it in the microwave, and wrapped it around the base of my neck. The aromatherapy was great, and it dulled my headache enough to restore my will to live." —Katie P.
"OMG, finally something that works! I've had tension and migraine headaches for around 20 years. I've tried everything: over-the-counter medication, prescription medication, pain injections, going to the chiropractor, etc. This topical oil has given me relief for nearly six weeks now. I've only had two or three headaches in that time and they were mild. I've already ordered more so I have some in my car and at home, and I bought some for two of my friends who suffer from chronic migraines. I would recommend this product to anyone with migraines — it's phenomenal." —Mary D.
So even if it's not technically ~magic~, I seriously recommend this to anyone who whose life regularly gets interrupted by headaches. You deserve better! Find more great headache relief products here.